Professional certification programs may offer you a fast-track and cheaper route to a new career. Certification programs can help highly educated people who needs a new skill or less educated persons who wants a license to practice in a new field. With an online certification program you can work on your own schedule to get a certificate while keeping your full-time job. How a certificate program helps me in making a career change? Which professional certification program is right for me? Is a certificate program worth my investment in efforts, time and money? Those are some questions that you may have asked about certification programs. This report tries to answer those questions. 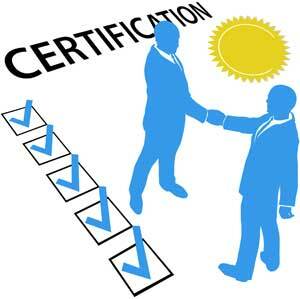 Professional certification is a designation given by a certifying body to people who have completed specific training. If you have a professional certificate it indicates that you’re qualified to do a certain job related to the designation you have. For example, if you are a certified medical assistant you have a qualification on medical assistance. A professional certification program covers a set period of training on a particular aspect of a field. Depending on the program, participants can take academic credit from it for bachelor’s and master’s degree programs, if they want to go for a degree program with the institution later. However, people who already earned a bachelor’s or a master’s degree can take it as a non-credit continuing education. When you apply for a job that requires specific competencies, employers will need you to show that you’re qualified to do the job. They ask you to give a trade certification from a relevant certification body. For example, if you apply for a computer network job you must have a computer network qualification. Employers are confident with your knowledge because you have a computer science degree. But they rely on certifying bodies for a specific set of computer network skills. This means you need to get a computer network certificate if the job requires you to have one. Who Issues a Professional Certificate? Certifications are usually given by professional bodies and corporations. It is like a license. However, while a license is necessary by law, certification is generally voluntary. There are some designation organizations that are directly related to the designation. For instance, a software company may offer to certify people for using its products. Microsoft certifications offered by Microsoft to IT professionals are one of them. You are a certified professional after completing a set of training sessions and passing an exam. Unlike a general designation where you can get a suffix such as MA after your name, a professional designation does not offer the post-nominal. There are two types of certifications: those that need to be renewed periodically and those that last a lifetime. For the purpose of part or whole of the certification renewal, you must show evidence of continual learning or continual education. If you’re a career changer getting a certificate in a new field is faster and cheaper than pursuing a degree program. By having a certification your chance of getting a job offer is higher. Prospective employers are confident that you are qualified to do the job. Which Professional Certifications are for You? 1. Online certification programs are one of the most popular ways to get professional qualifications. If you’re looking for a shorter training period, online certification programs are the way to go. 2. One of the common online certifications are computer certifications. However, the information technology certifications are a bit tricky to find. To avail of a Cisco Certified Network Professional (CCNP) certification you have to finish their online course and pass the exams. 3. A Cisco CCNA certification or Certified Network Associate certification is the first rung on the networking ladder of the Cisco certifications. This level is best suited for help desk engineers, field technicians and beginning networkers. 4. Another popular professional certification is Microsoft certifications. Getting a Microsoft certification is a good for introducing yourself to IT related jobs roles and responsibilities. Today hiring managers are looking for people who are certified as Microsoft professionals. 5. MCSE certification is available for professionals who want to professional in business solutions. The Microsoft Certified Systems Engineer is suitable for systems engineers, technical support engineers, systems analysts, network analysts and technical consultants. 6. Want to be a project management professional? A project management certification can help. If you’re a holder of a project management certificate, you are certified to do project management jobs. Using the professional certification you can convince prospective clients that you are capable of handling project related activities. Enrolling in the right certification program is essential for protecting your time and money. Make sure that your prospective employer views your certificate as a must-have document. You may also want to talk to the program manager how you will use the document. Another way to check whether to go with a certain certificate program is to ask experienced professionals in the field. You can find those people on online forums like Quora or just ask a friend to refer you to professionals they personally know. Use the resources to learn about how the specific certification fits on the big picture of certification programs in the field.